Denise has been hiking Wachusett Mountain at home while I have been on my trip. I thought it would be good to get her out on a hike here today. 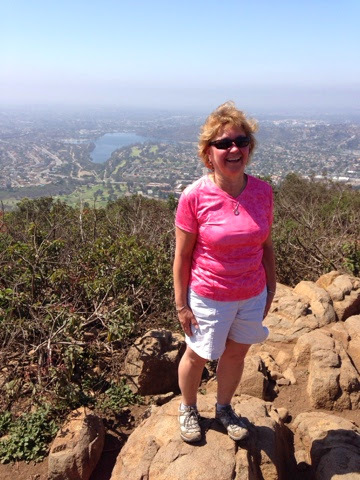 She decided on Cowles Mountain that I hiked the day before yesterday. It is a great hike with a good workout that doesn't take all day. I got her to laugh for the photo. This is such a popular hike that there were plenty of others on the trail. There was even a a bus load of children that we were lucky to get ahead of on the way up and went down before them. On the way down the mountain there were at least two rattle snake sightings by people headed up. I still can't complain about not seeing one yet. The rest of the way down I kept a close eye on the trail. Once down Denise and I had a nice lunch. Since we haven't seen each other for two months it was nice to have the alone time to talk. After lunch I took her to Roadrunner Sports www.roadrunnersports.com where she might find some hiking clothing. She was interested in walking shoes so she signed up to have acomplete analysis of her feet with a specialist using a technical machine. The machine was a computer and the technician working with Denise got some basic information about her. They wanted to know what kind of shoes she was looking for, what thickness socks does she use, etc. They then size her feet with a brannock device, analyze the weight distribution of her feet and curve of arch. They capture this and all information in the computer. Next since she wanted walking shoes they filmed her walking and captured the information in the computer too. Lastly they mold shoe inserts that have been heating up to her feet. Now with all this done they tell you about your feet, shoe size and hand you over to someone to have you try shoes on and send the information in an email to her. Denise found that she was wearing a shoe size too small (half size) but when she actually tried on shoes she found out she needed one full size larger than what she has been wearing. This whole work up costs money but you do get a custom shoe insert and a guarantee that if this doesn't solve your foot pain problem you can return the shoes and get new ones at no additional cost. When I was young I too found out that I was wearing one full size shoe too small. When I got these first larger shoes my feet felt much better. We will be doing a lot of walking while she is here in San Diego so she should know how this change works for her. 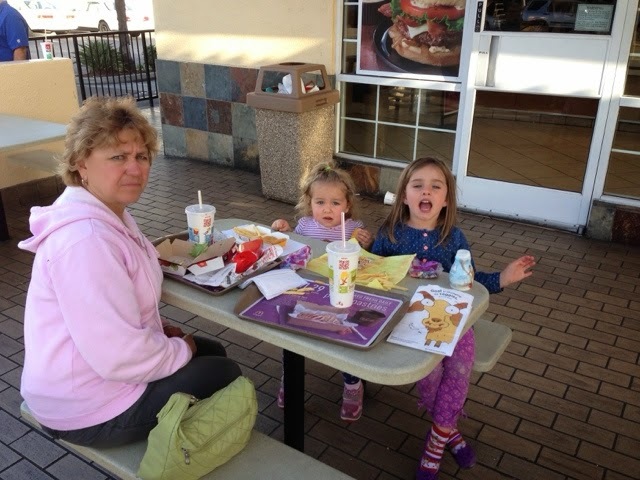 We got to watch our granddaughters this pm and took them to McDonald's for dinner. Then off with them to do some grocery shopping before meeting Dana at home. Clayton is on her way home as I write this. 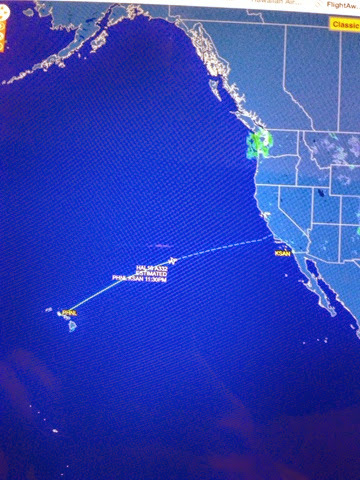 He is off the USS Boxer the other day in Hawaii and the Marines are flying him and a few other officers home this evening. He is about half way home and Madison and Taylor are in bed with a bunch if pent up energy to see daddy in the morning.